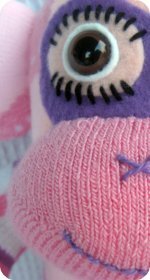 You might want to try a Rockford red heel sock monkey kit if you are looking for fun sock crafts - they are available in both girl and boy monkey kits. Sock craft and monkey craft to the max, with a stupid sock creature or two thrown in the mix! So, where do you buy a sock monkey or sock doll kit from? Right here if you want to! 21'' Peejay Sock Monkey Kit Fiberfill for stuffing is not included. Recommended for children 9 years and older. Adopt a monkey - this 21'' monkey kit also comes with adoption papers for Peejay. This sock monkey kit contains: Two original Rockford red heel socks, buttons, cotton floss, felt, flannel, pom-pom, embroidery needle, instructions. Miss Kitty Sock Monkey Companions Kit This kit makes one 21in Miss Kitty sock cat. The package contains: two socks, cotton floss, felt, ribbon, embroidery needles, material for a dress,felt for her toy mouse. Instructions are in English, French and Spanish. Make Your Own Stupid Sock Creatures The new, smaller 48-page instructional booklet has all the basic how-tos and illustrated cutting instructions for almost every project featured in the original volume, plus a brand-new design for a rainbow-striped creature! In addition to the booklet, the kit includes:- one pair of snazzy rainbow-striped socks with toes, one pair of solid-color anklet socks, polyfil stuffing. Sock Monkey & Friends Featuring step-by-step instructions for 9 unique sock creatures including a cat, bear, pig, rabbit, elephant, and even a crocodile plus basic sewing instructions for beginners and all the materials needed to create an adorable sock creature. Includes: 64-page instruction book, one pair of rainbow-striped socks with toes, one pair of solid-color anklet socks and polyfill stuffing. Peejay Sock Monkey Counted Cross Stitch Kit 2-1/4 X 2-3/4 Oval 18 Count A cute cross stitch Peejay sock monkey kit. Great for a beginner cross stitch er. A perfect addition for someone with a Peejay sock monkey doll, he's even holding a little teddy bear just like the real Peejay monkey. 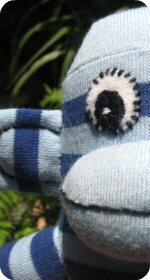 The directions for sock toys are generally simple and if you do not have a sewing machine it is OK, as these sock creatures can be completely handmade (it just takes a little longer). Sock crafts are great for kids, children get to make totally original pieces of stuffed art. Anything goes when it comes to being crafty with sock dolls. 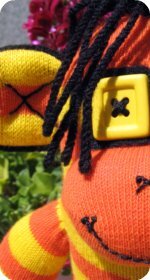 You can stick to a classic looking sock monkey, alter expressions on the face, dress in any clothes, add any accessories and make any animal or crazy, wild, weird creature that you can think of out of a sock. Some kits contain red heel socks and some have other styles of socks. This photo is of the bears I made from the Peejay monkey kit. The kit contained all the felt and floss needed to make the brown bear. 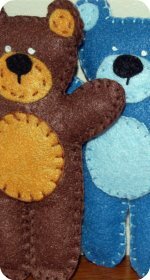 The brown bear was so cute that I just had to make some more in different color felt. Tip: Whenever you buy a pair of original Rockford Red Heel Socks they include free sock monkey and sock elephant patterns on the packaging. 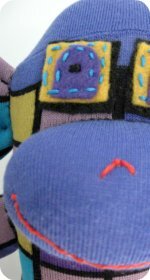 The patterns for the little felt toys in the sock animal kits make very cute little accessories. When I made Peejay sock monkey and his teddy bear all three of my boys wanted their own felt teddy. They stand about 6 inches tall, the felt teddies that is, not my boys. Actually, another idea is to use green and red felt and make Christmas teddies, don't you think they would look really cute on a Christmas tree. I love homemade Christmas decorations for trees! 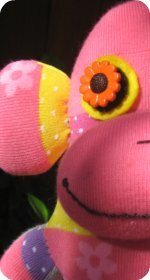 Of course the teddy pattern could be used to make felt sock monkeys too - use brown or grey felt for the body, a white round mouth with a smaller red piece of felt in the center. Black stitching for eyes and mouth. Skip the tummy patch that the bear has but give your monkey white felt on the ends of his arms and legs.